Skip the restaurant and stay in tonight and make your favorite curried eggplant. This Air Fryer curried eggplant is crispy on outside, tender inside and loaded with curry flavor. One bite and you will be hooked! Plus since this recipe is air fried, you save on all the empty grease and oil. 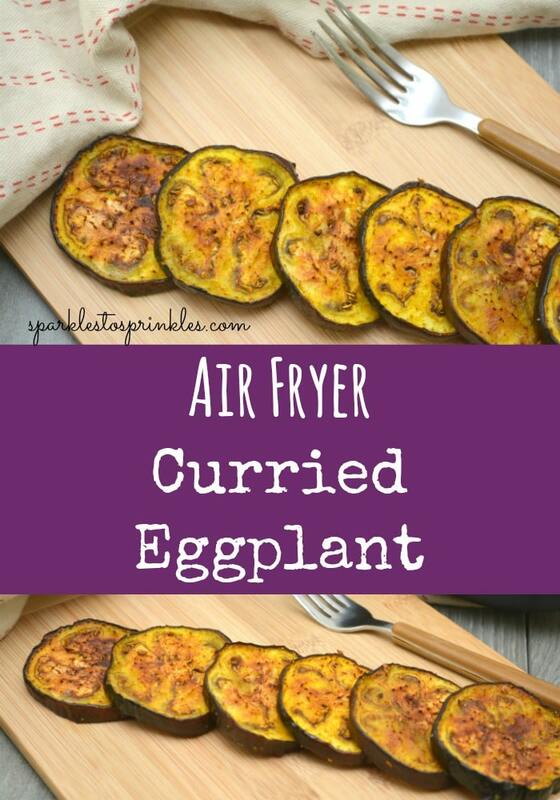 These Air Fryer Curried Eggplant are delicious and crispy. I love eggplant. Whenever eggplant is in season I will buy them just on a whim and will figure out what to cook with them later. Sometimes I scramble for a new idea. One of my favorite ways to eat eggplant is to fry it. It is delicious fried!!! But my hips do not love all of those calories. Not to mention the extra cholesterol. Using my air fryer to cook these cuts out that cholesterol and a whole lot of guilt. Now I can enjoy the deliciousness of eggplant without all that grease. Adding curry into the mix just makes this over the top delicious. If you love curry than you will LOVE this recipe. Not a huge fan, do not feel bad. Just use a season all, or garlic powder in place of the curry. If you love Eggplant than you will also love my Air Fryer Eggplant Parmesan. It is delicious!! Because we use hot air to crisp up this eggplant you don’t have the grease and cholesterol like traditionally fried eggplant. Eggplant is loaded with vitamins and minerals! And eggplant is a nutrient dense fruit not vegetable (crazy right!)! Eggplant is also loaded with fiber to help keep you fuller longer. And can help with digestion, headaches, and even be a mood booster! Those are a few of the reasons why Eggplant is best to rotate in your diet when you can. When finding a ripe eggplant reach for an eggplant that offers a smooth and shiny skin. You want it to also feel heavy for the size. I verify this by weighing out two in each hand to see which feels heavier for the size. Also one tip I use is smaller eggplants will offer you a sweeter flavor, that tend to be less bitter. Plus smaller eggplants have fewer seeds and a thinner skin. Eggplant offers a slightly firm texture, but you do not want it to be hard. If you gently press on the eggplant skin and your finger punctures the skin, it means it is gone bad. You want to have eggplant have the feel of a ripe tomato. My newest kitchen accessory is my Ninja Foodi. It is an Instant Pot and Air Fryer in one. You can also use the crisping lid and make this curried eggplant in your Ninja Foodi if you own one. The Ninja Foodi has two different lids, so you can go from pressure cooking to air frying. This kitchen accessory has been such an amazing tool for my kitchen! If you are debating buying one or not, dive in and give it a try today! As you can see my Air Fryer Curried Eggplant is such a simple recipe. Not much prep for that crispy outside with a tender and flavorful center. This is the perfect appetizer or pairing to add next to your dinner. Great for serving your family or a crowd. If you love eggplant you will go bonkers for this simple curried eggplant. Just serve warm as it tastes best that way! 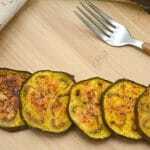 Delicious Airy Fryer Curried Eggplant is delicious, crispy and easy to make. 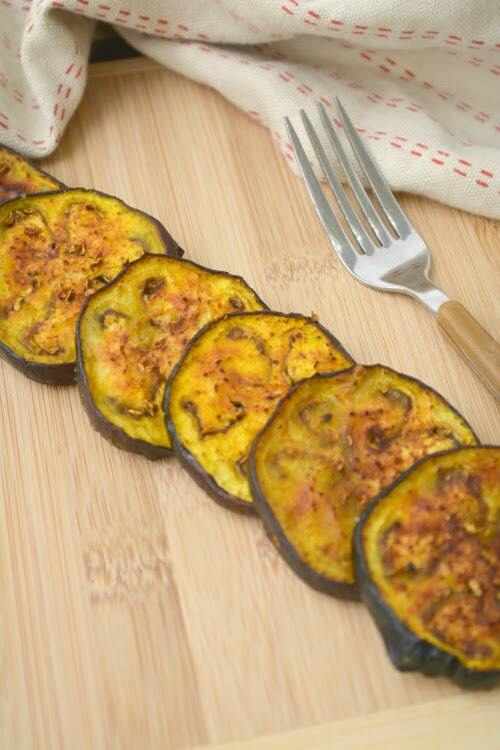 If you love curry, you will love the delicious twist on this eggplant. Set your air fryer to 300 degrees, and preheat it for 5 minutes before adding in your eggplant. Slice your eggplant into ½ inch sections. You can remove the skin at this point as well if you prefer. Pour 1 tablespoon of olive oil over your sliced eggplant in a bowl. Add 1 clove of minced garlic to the eggplant. Toss in salt to taste. Sprinkle on ⅛ of a teaspoon of tumeric. Add ½ teaspoon of curry powder to the bowl. Toss the eggplant together with the ingredients so that the slices are all coated well. Add the eggplant slices to the heated air fryer, and cook for 10 minutes, or until the tops are browned and crispy. These came out delicious! I will definitely peel them next time. I cooked them a little longer to get them beautifully browned and crispy.